Jackfruit has recently become a sensation among vegan and vegetarian foodies and it is widely used as a meat substitute. It it possible thanks to its earthy flavour and a unique texture that resembles meat. In many Asian countries raw jackfruit is a staple item on the menu during its season. It needs to be picked when it is still raw and cooked as soon as possible, because it continues to ripen quickly. 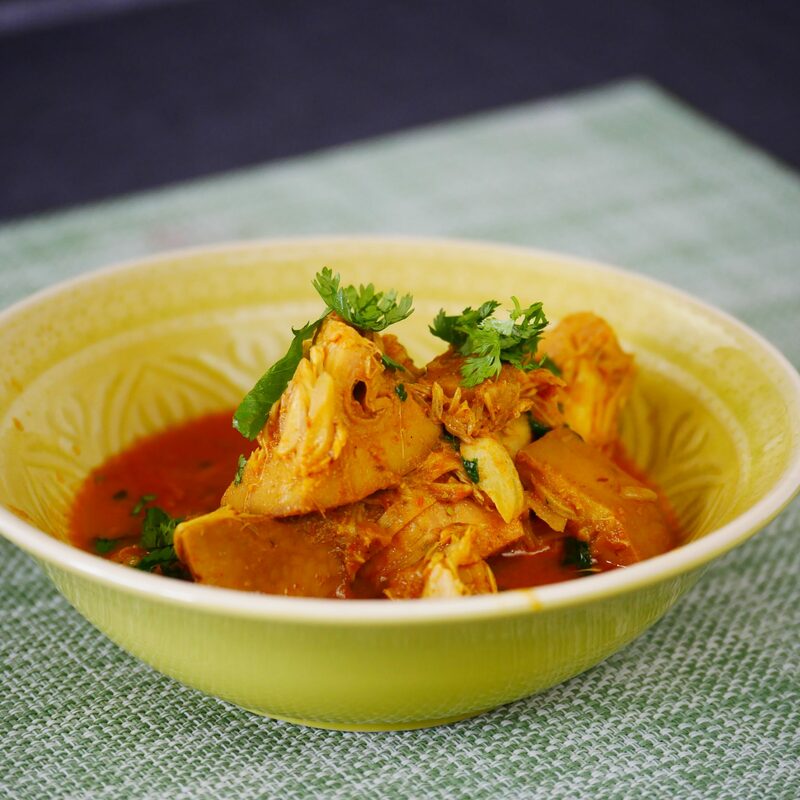 Our recipe comes from Indian cuisine – we will share with you a classic jackfruit curry recipe (kathal sabzi). If you’ve been reading us for a while, then you know that we only use fresh ingredients, so we will not be using a canned jackfruit. In the video below you can see the entire process of fresh raw jackfruit preparation, starting from peeling and cutting it. Be brave with spices, but also remember that you can make it as spicy (or not) as you like, just follow your taste buds. Step 2. Peel the jackfruit and cut it into big chunks. Take out the middle of the fruit (like you would do it for a pineapple). Step 3. Boil cut jackfruit for about 10 minutes, together with 1 tsp turmeric and 1 tsp salt. Step 4. Meanwhile, prepare a curry base. Add tomatoes, onions and chillies in a blender and pulse until it becomes a homogenous paste. Step 5. Now, time to make the curry. Heat oil in a pan and add whole spices: Indian bay leaf, cinnamon, cardamom, cloves. Cook for a couple of minutes until aroma starts coming out. Step 6. Add curry base and garlic ginger base, cook it together for a minute. Add a bit of water if necessary, so that it doesn’t burn. Step 7. Add ground spices: 1 tsp turmeric, 2 tsp coriander powder, 1 tsp cumin powder, 1 tsp red chilli powder. Mix everything nicely. Step 8. When the spices blend together nicely, add the jackfruit. Add 1-2 cups of water (depending on how “soupy” you want it to be) and cook for about 15 minutes, until jackfruit becomes soft. Garnish with fresh coriander leaf.